In the summer particularly, it becomes increasingly difficult to manage the water levels in your pool. Some of the time, your depleting water levels are caused by evaporation from the intense summer heat. We have a simple test that you can conduct yourself to identify if you have a leaky pool. Take a 5 gallon bucket and fill it up with your pool water about an inch to the top. Then place the container on a step in your pool, making sure it not quite totally submerged. Once you have the bucket in position, mark the water level inside and outside the bucket. Let the water sit a day and then measure how much the water levels are depleted in the container and the pool. If the water level dropped the same amount, then it is simply evaporation. 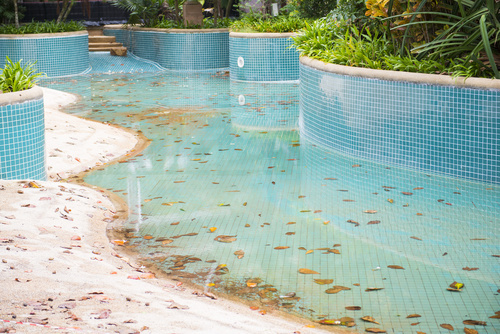 If the water in the pool has dropped more than the water in the container, you definitely have a leak and need to call Triangle Pool’s pool repair in Clearwater. If a leak is responsible for depleting the water levels in your pool, get in contact with our professional repair experts in Clearwater. Not for the sake of your pool, but for your wallet as well. The more water you let leak out of your pool, the more money you are literally pouring down the drain. Our professional technicians will be at your house as soon as possible to begin their thorough investigation of the leak. This process is an exam of the lines that circulate the water throughout your pool as well as an inspection of all other potential leak zones. Once we identify the leak, our staff will patch the leak to make sure that your water flow is as streamlined as possible. Another common problem that plagues a lot of pool owners is the dreaded pool pump. As one of the key components to a functioning pool, the pump is the one of the hardest working parts. So, it is more susceptible to breaking down. If your pool pump begins to burns out, you will know quickly; it will become extremely loud as it begins to malfunction. Once it ceases to function, the water in your pool will become cloudy. The water could also turn a deep green color as algae blooms. If you experience these symptoms, give our pool repair in Clearwater a call. We will be there to help you out. Not every person who owns a pool is going to have the time, experience, or knowledge to maintain or fix their pool. This is where our pool repair services in Clearwater steps in. Our 50 years of experience guarantee that your pool is back up and running and that you are back to relaxing and enjoying yourself in your amenity. If you encounter any pool problems, obstacles, or questions, give Triangle Pool’s pool repair service in Clearwater or Tampa a call at (727) 531-0437 and our professionals will be there to help.